Rachel Held Evans has spent the past year sewing her own clothes, cooking for her husband, doing penance on her roof, foregoing hair cuts and occasionally sleeping outside in a tent — all in the name of adhering to the Bible’s definition of a good woman. Evans wrote about her radical life experiment of living “A year of Biblical Womanhood” in a new book that examines the Bible’s rules for how women should behave, and how those tenets might apply in today’s society. Evan said the term “biblical womanhood” has created a popular movement, but also confusion over its true meaning. She said she hopes the lessons she learned from the past year will help shatter some of the unrealistic expectations the term has built up for conservative Christian women. Read an excerpt from "A Year of Biblical Womanhood"
Evans approached her task in various ways. To keep from becoming contentious, she kept a “swear jar” and spent a minute on her rooftop in public penance for every penny she contributed. 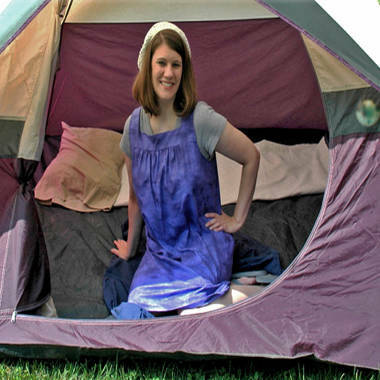 Rachel Held Evans slept in a tent during her period every month as part of her year-long project. To adhere to specific rules about femininity, Evans wore flowing skirts and skipped haircuts. And when she got her period every month, she avoided hugs and even handshakes from her husband and slept outside in a tent. But Evans also got to do many fun things, like cook for her family, including during Jewish holidays for the first time. Evans acknowledged that some critics feel she is making a mockery of the Bible. She said she is doing just the opposite.